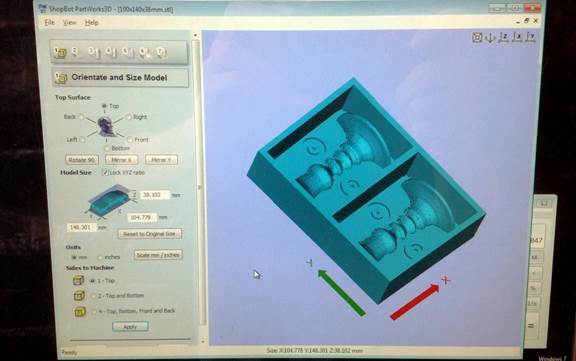 First, open partworks3D and upload your STL file. 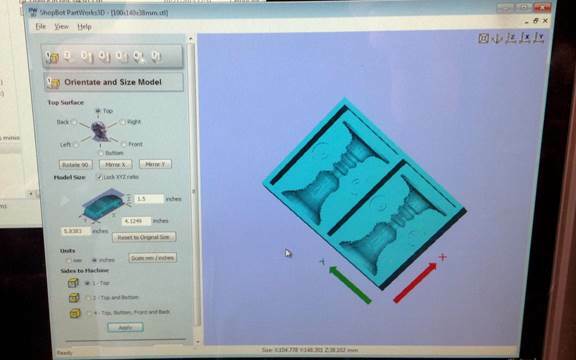 Make sure your model is oriented correctly and that size is right (either mm or inches). 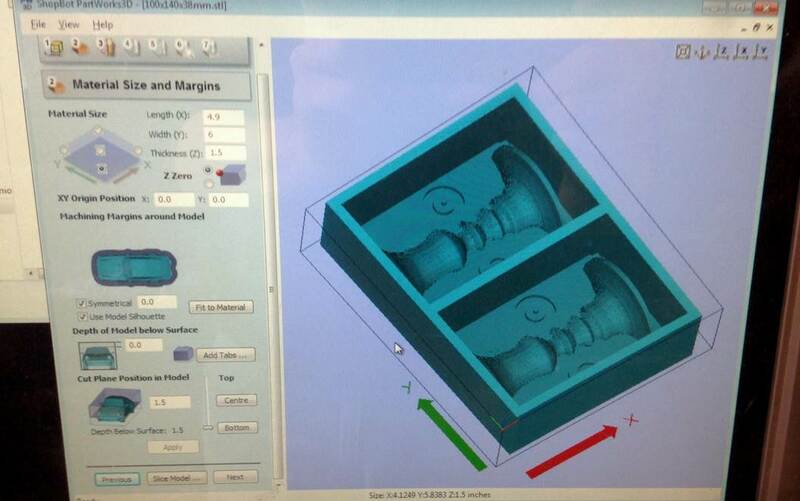 To get it in the right X\Y plane, switch between the “top surface” options. To fix size, play with the units radio buttons and the “reset to original” button until you get it right. Remember that 25.4 mm is 1”. Next step is material size and margins. Here you define the size of the wax piece you are milling. As always, it is useful to measure it from the top of the front right corner. Once you click “apply” a wireframe will appear on screen that matches the measurements you used. Pay attention that you use the same unit system (mm or inches) as you did in the previous screen. If you don’t see a wireframe it probably means your units are off. If you don’t model your design already within a box frame, you can use the “machining margins…” and “cut plan position” to define the boundaries of your work area (walls and floor for your model). Default settings are shown above. If you use a non-zero margin, it will appear as a gray area surrounding your model. Once you’re done click “next”. Next screen is the roughing toolpath (the toolpath used mostly to excavate most of the wax out). First you need to choose the tool you’re using. In this case I used the 3/32” end mill. It wasn’t on the list so I had to click “new” and define its settings. For overlap, Partworks accepts any value between 2-50%. The higher the overlap, the higher the resolution and the longer it takes to finish the job. For roughing you should use a high stepover (=low overlap). For wax (and foam) the spindle speed should be 6000 rpm. The feed rate for 1/8” end mill is 75mm/sec, so to use a 3/32 end mill you need to multiply that number (75) by the ratio of the end mill size (1/8=4/32, so ratio is 3/4). That gives a feed speed of ~56mm/sec. double check the units before you click ok.
After you pick the tool you need to choose strategy. For roughing it doesn’t matter a lot if you pick raster X or raster Y, but it might be useful to remember your choice for the next step (finishing) to select the opposite direction if you’re short on time. Click calculate and it will show you the path and estimate the time. Partworks tend to down-estimate time, so be comfortable adding at least 10% to the number you get. 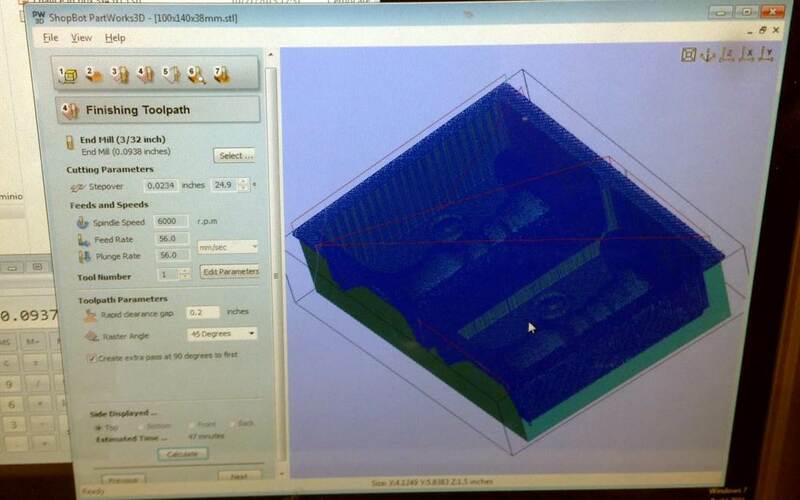 This is the finishing toolpath screen. Here you can select a different tool (I didn’t) and change the stepover\overlap percentage. 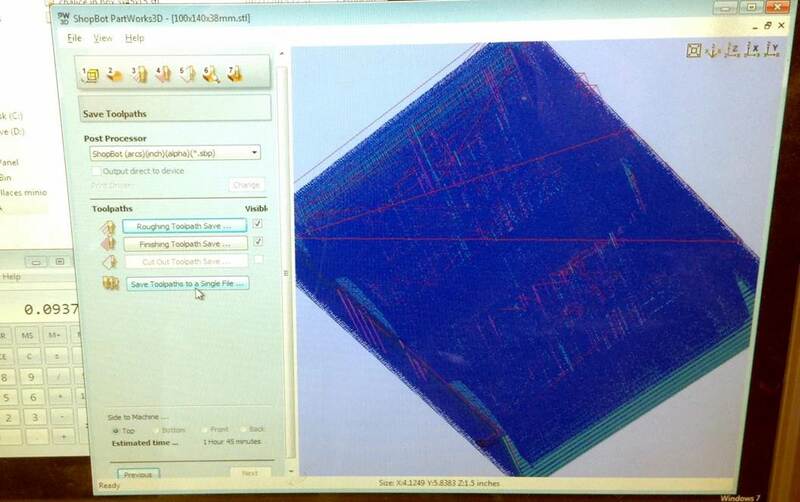 For raster angle the default is 45 degrees, and you have the option to add an extra path at 90 degrees to that, which make this phase twice as long but gives higher finish. 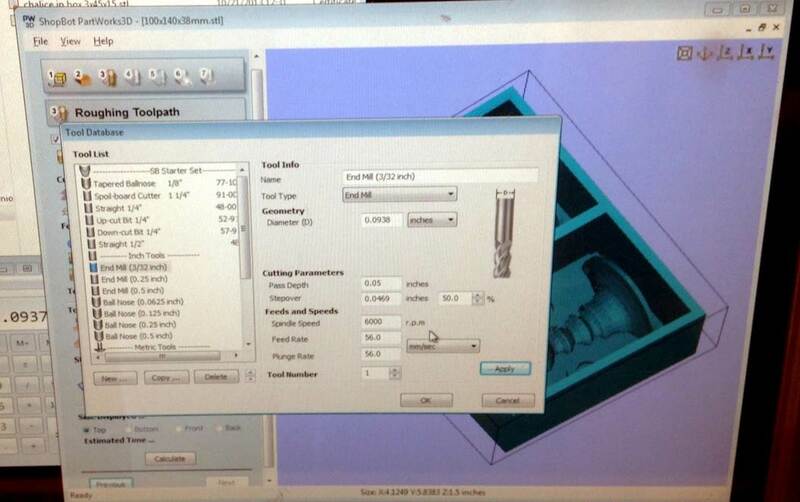 If you’re short on time, you can select the Y axis (if you choose X for roughing) or vice versa. Click calculate, see timing, and click “next”. The next screen (#5 on the partworks3D workflow) is for cutout and is largely irrelevant for what we are doing, so just click next. On the next screen (#6) you can animate the toolpaths. Use it to check for any missing features on your model and change tool settings (or go back to the drawing board) accordingly. You should save your toolpaths in the default (first option) setting: arcs-inches-alpha. Make sure both the roughing and finishing checkboxes are marked, and save to a single file. Here you can also see the estimated total time it should take (again, it is usually a bit too optimistic). Lastly, at least in IDC, make sure the speed on the machine itself matches your settings. 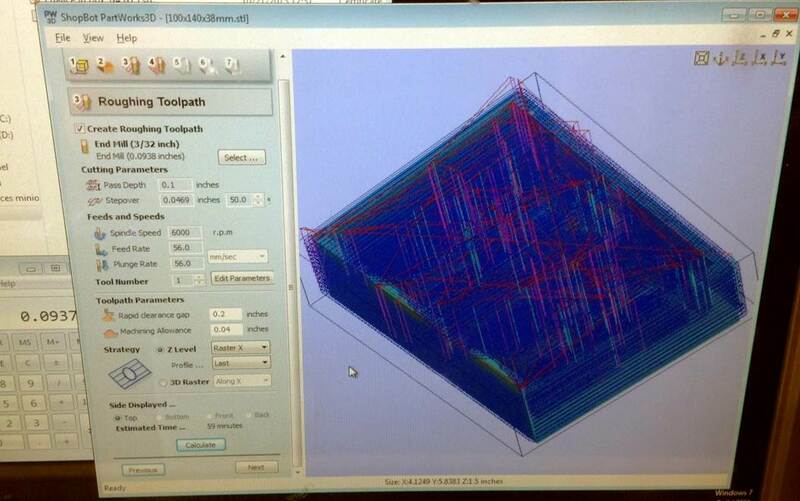 For comparison, here are videos of roughing in ShopBot VS roughing in Modella.